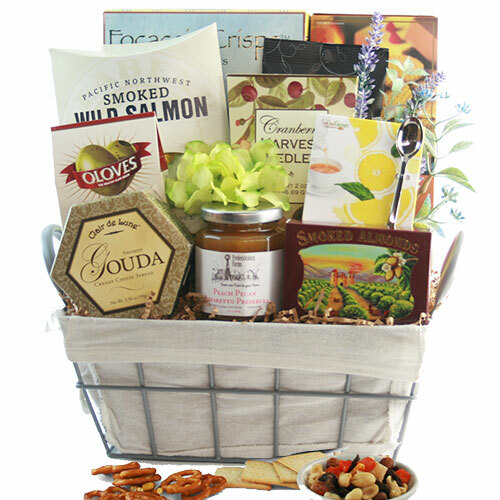 Our gourmet gift baskets bring an air of refinement and sophistication of palate to the homes of foodies, oenophiles, chocolate lovers, and anyone who appreciates good taste. 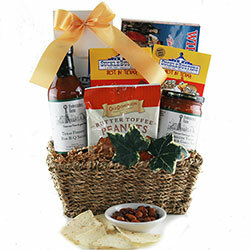 If you’d like to send something special to a person who is suited for the finer things in life, these gourmet baskets are just what you’re looking for. 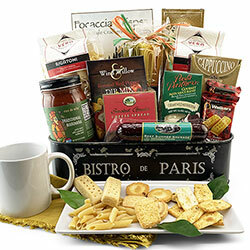 The gift baskets are full of tasty foods and savory sweets, such as imported chocolates, rich coffees, aged cheeses, fresh pastas, and more. 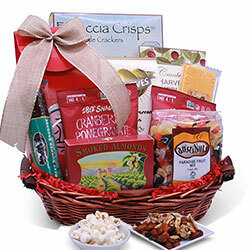 Some even include wine and bubbly, for those that enjoy raising a glass or two. 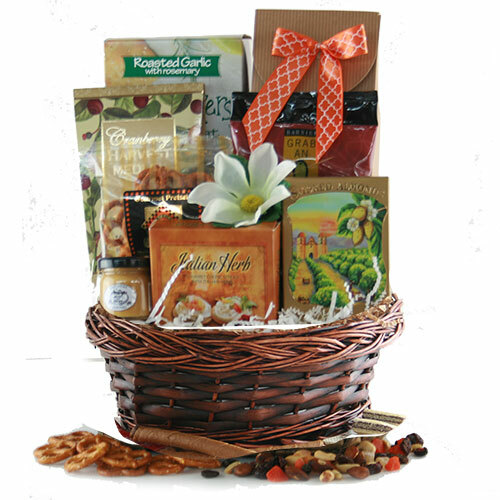 The items in each gourmet basket all complement each other, both in taste and smell, so your gift will be beautifully packaged and well received. 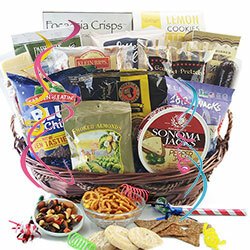 If nothing caught your eye as you browsed through our standard designs of gourmet gift baskets, you can create your own. 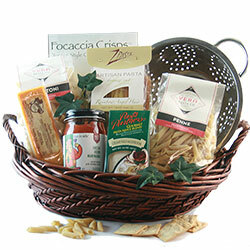 Our Design It Yourself process is easy and allows you to personalize your gourmet basket to your liking. 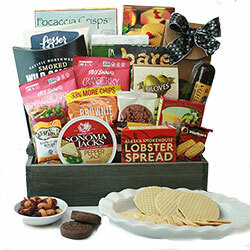 Try it now: Custom Gourmet Gift Baskets. 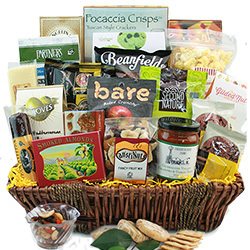 Do you have a friend or loved one who is particular about eating only the finest meats, freshest vegetables, and purest sweets? 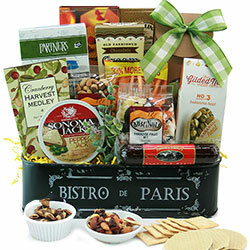 Foodies savor every bite and experience life through their taste buds. 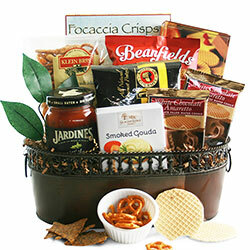 To make a foodie happy, you need to go straight to their stomach with a gourmet food basket. 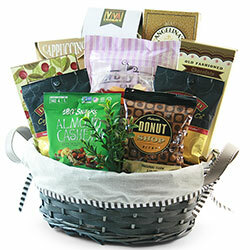 Filled with epicurean delights, these baskets include item after item that will please the palates of the pickiest eaters. 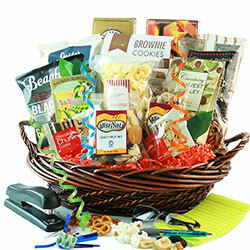 And the benefit to you is that you can easily (and quickly) find the perfect gift. 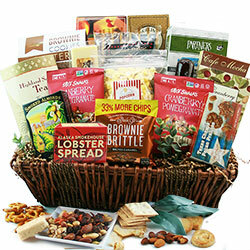 On this page we have included a small sampling of the most popular gourmet gift baskets we offer. 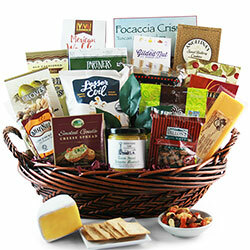 But keep in mind that there are many, many more, in a variety of categories! 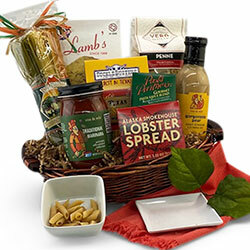 If you want to browse more food gift baskets, check out our other predesigned baskets such as: Italian Food Gift Baskets, Texas Food Gift Baskets, and Breakfast Gift Baskets. 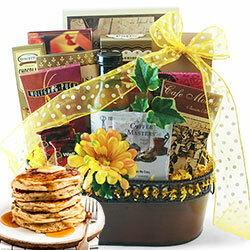 Chocolate Gift Baskets: Offer someone that elusive golden ticket to the chocolate river in Charlie’s factory with one of our sweetest gift baskets. 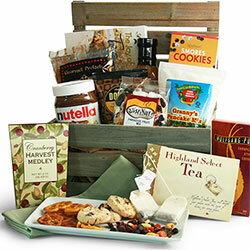 Our chocolate baskets include the finest confections from Ghirardelli, Godiva, Lindt, Marich and more! 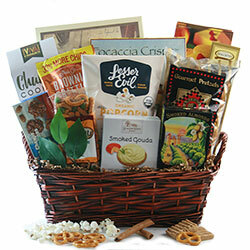 Cocoa, wafers, candy bars...the good stuff comes in all forms, and is sure to please the sweetest of teeth. 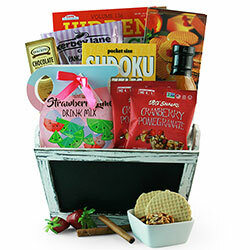 Coffee Gift Baskets: Send a wake-up call to the caffeine fiend in your life with a coffee gift basket packed full of energy. 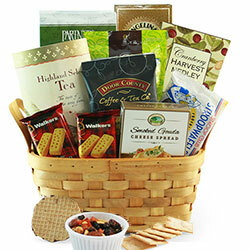 Dark roasted and bitter or smooth and creamy, the high-quality coffee selection in the baskets is complemented by the scones, biscuits, and cookies also included. 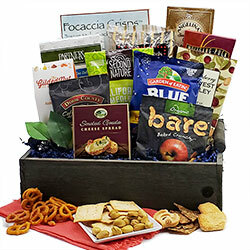 Cookie Gift Baskets: Cookie monster? We know one or two ourselves. 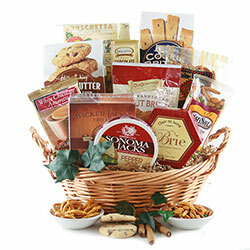 Send a cookie gift basket full of flavors like shortbread, key lime, lemon, and the classic chocolate chip. 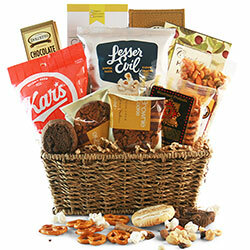 In some cookie baskets, you’ll also find other sweets like brownie brittle and amaretto wafers. Also included are teas and coffees, to help wash down those tasty crumbs. 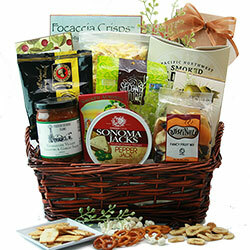 Wine Gift Baskets: Giving wine as a gift is one of the most time-honored and beloved traditions. 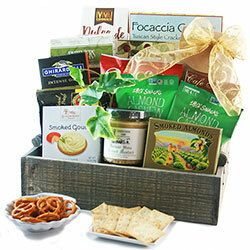 A wine gift basket will be even more appreciated by your recipient. 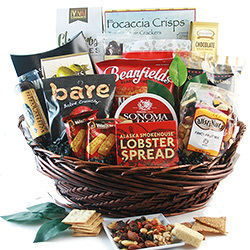 You can select which red or white (or both) vintages you’d like to include in each carefully assembled basket, which is full of gourmet foods and sweets that will complement your wine selection. 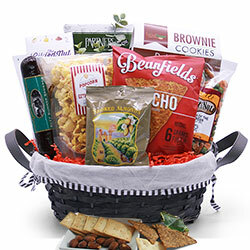 The majority of gourmet gift baskets can be shipped via Standard Ground for a flat rate of $11.99 (shipping destination must be inside the continental United States). Standard Ground service typically arrives in 3 business days or lless. Shipments to Texas typically arrive within 1-2 business days. 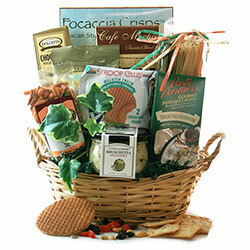 If your gift basket is being delivered to the Houston area, we offer same-day delivery!